Objective: Provide students with an Integrity in Action Checklist, which serves as a decision-making model. Students have the opportunity to practice utilizing the checklist on relatable, hypothetical scenarios. Space can be a complication in this activity. It is ok if there are desks and tables in the middle of the circle. Also, you can adjust the group size as needed to accommodate for space limitations. Each individual interprets these rules as they see fit. If you feel you break one of these rules, you must step back from the circle and sit down. No one can decide for anyone else if a rule is broken, even if you think someone should be out. After playing one round (approx. 3 minutes or until only one person is still standing) tell students to think about how their classmates played the game. Did they interpret the rules the same way you interpreted the rules? Are you going to adjust the way you play the game in round two? Play a second round with the same rules. Ask students to raise their hands if they feel like they followed the rules. Then ask students to raise their hand if they feel like there was someone in their group who did NOT follow the rules. Typically, everyone thinks THEY followed the rules, and everyone thinks that SOMEONE ELSE did not follow the rules. Ask students how that could happen? Process the Activity – You can’t have a little bit of integrity; you either have it or you don’t. When you are looking to others to see what you can get away with, that’s a time when you need to ask yourself some questions to make sure you are making the right choice, not just the easy choice. We all make hundreds of decisions each day. Sometimes determining the right choice is easy, but on occasion we have to make a decision where the right choice either isn’t as clear, or is otherwise difficult to make. Ask students to share an example of a difficult decision they have made. In these moments, we sometimes look around to see what others are doing and what we can get away with, like in the Integrity Ball game. A better idea is to have a strategy that helps us make the right decision. The tool we use to help us make hard decisions is call the Character in Action Checklist: Six Pillars. 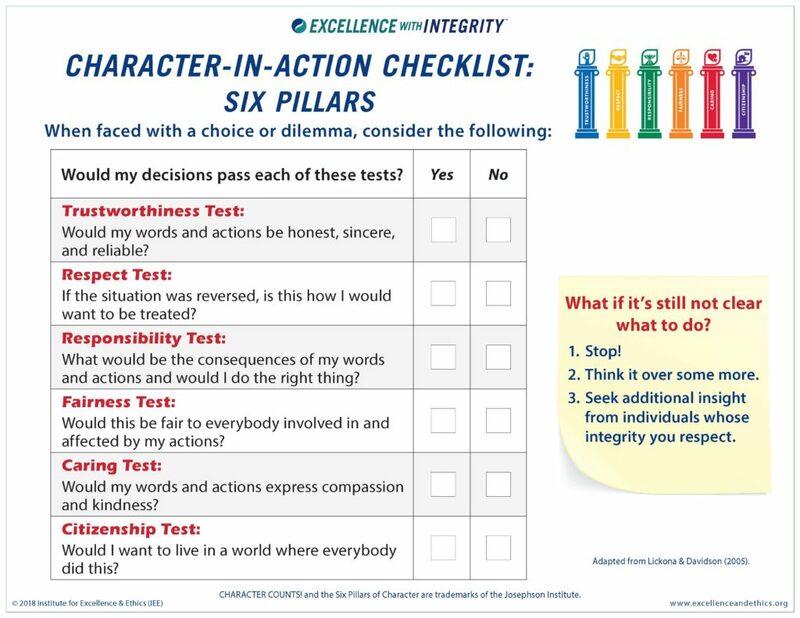 The Character in Action Checklist: Six Pillars consists of nine questions that when applied to a difficult decision can help us determine the right choice to maintain our integrity and trustworthiness. Practice applying the questions to the hypothetical situations below. Jimmy is at a special matinee movie where the tickets are $6.00 each. He gives the box office cashier a ten-dollar bill. The cashier is very busy and gives Jimmy $14 in change (she thinks Jimmy gave her a twenty-dollar bill). What should Jimmy do? Your best friend Ashley is failing her Language Arts class. If she doesn’t do very wellon the final test, she may have to go to summer school and miss a vacation trip that you had planned together. A week before the final test, another student, Calvin, offers her a stolen copy of the final test. Ashley isn’t sure what to do and asks you. What do you tell her? Samantha tells you that she was in a loud argument with Jessica at school on Friday and got a three-day in-school suspension. If Samantha tells her folks about the suspension, she’ll be grounded over the weekend and will miss the big school dance. If she doesn’t tell her folks, they’ll get a letter from school on Monday. Samantha was going to the dance with you and asks what she should do. What do you tell her? Your math teacher allows you to grade your own paper. If you give yourself credit for an answer that should be marked wrong, you will get a higher final grade in the class. Would you? Encourage parents to watch this short video with their kids. After watching the video, parents and students should write three commitment cards to one another. Parents keep the cards of their children, and kids keep the cards of their parents. When the promise is filled, the card is returned. (Note: you can order promise cards from Because I Said Would if desired, but it is not necessary. Any notecard will suffice).